A recent Gallup poll showed Americans to be almost evenly divided on the issue of doctor-assisted suicide, with 48 percent saying it is wrong, and 45 percent saying it is morally acceptable. 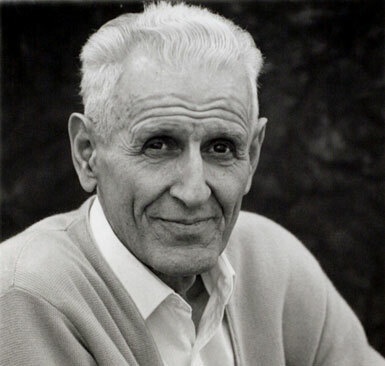 This finding, as part of a larger poll on American moral issues, had already started to reignite the debate just days before Jack Kevorkian, the man who ignited the debate in the 1990s, died of kidney related problems. There are only a few spots in the world where doctor-assisted suicide is permitted: Belgium, Netherlands, Luxembourg and the states of Oregon, Washington and Montana. Why is doctor-assisted suicide such a lightning rod? Laws governing suicide and prevailing thinking about it, especially in countries whose legal systems have roots in Greek, Roman and Judeo-Christian legal and intellectual traditions, have two threads in common. 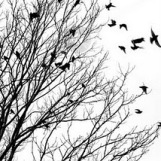 They stigmatise the suicidal as unworthy and totally disregard personal autonomy. To Aristotle, committing suicide was immoral and robbed the state of one’s civic and economic contributions, therefore, an offence. Modern laws, especially since the Industrial Revolution, have roots here. Society has a claim to an individual until death. Plato argued people are property of the gods. Stick around until the gods decide otherwise. Christianity fits in this category, sacredness of all life, including vegetative one plus sinfulness of committing or attempting to commit suicide. Here in the US, the issue is closely tied to Christian values and the pro-life movement. Although opinions vary somewhat from faith to faith, the general agreement among faiths which appose doctor-assisted suicide is that it violates the sanctity of life and interferes with the will of God. Human beings are the only species who are aware of their own mortality. This causes us much anguish. It affects nearly every aspect of our lives. We work so that we can buy and do things that either promise longevity or distract us from thinking about our mortality. We seek youth and vitality and are at our most gullible when we are promised a means of cheating death. All of this is very surprising when we look at life and death as bookends -- a set that can never be sold individually. We obsess over birth. We attend classes to prepare us. We have multiple meetings with doctors to ensure that the process is satisfactory. We shower the infant with gifts before it arrives. We celebrate its entrance with cigars, yard signs, and glossy photo announcements. There are superstores devoted to the beginning of life. There are entire sections of bookstores devoted to preparing for birth, and guides about those first months of life. There are drugs that we can take to ensure that birth occurs with ease, with as little pain as is possible. We expect to be treated with dignity and respect as we usher in a new life. Yet, that other lonely bookend, dying, is comparably neglected. There are no classes, no parties, no superstores, no sections in bookstores, no detailed guidebooks. Granted, some of these would be silly, but the point is quite clear: we do not prepare for death. We neglect to learn about what it will be like, or to discuss it with our doctors in advance, as we certainly would a birth. We neglect to ensure that the process of dying is satisfactory. If we didn't already find death horrifying, we would find all of this to be almost comical. We are so in denial that it's kind of hilarious. Death does not have to be horrible. Sure, not many wish for their life to end, or for their loved ones to cease to live. But we all die. All of us. Why not talk openly about it? Why not learn about what we can expect during the process of dying? Why not have the option to exit this life before we have lost control of our own bodies, before we are locked into an indeterminable period of suffering, before we can no longer retain our dignity or our ability to decide what is best for us. I guess it's somewhat understandable in our society that many saw Dr. Kevorkian as some kind of a monster -- a grim reaper figure who delighted in taking the life of others. On the surface it seems totally in line with our horror novels, and our television crime dramas. While we fear our own deaths, and the deaths of our loved ones, we have a tabloid fascination with the deaths of those outside of our own circle. We have voracious appetites for the details surrounding the deaths of celebrities, pretty teenagers, and toddlers (paging Nancy Grace). So, it's no mystery why the media ran with the moniker "Dr. Death" when Kevorkian's story gained traction. What this obscures, however, is the fact that Dr. Kevorkian was first and foremost a physician. He was a humanitarian who advocated for end-of-life awareness, counseling, and choice. We fail to recall that he rejected 97% of the assisted suicide requests that he received, and assisted only those who were terminal or in extreme suffering. There are many who would call Jack Kevorkian a hero. Jack Kevorkian was an activist who risked everything he had to stand up for a patient's right to die with dignity. He helped to transform a notion into a movement, and into a debate about individual rights. We are being stupid. We have been so successful in the past century at the art of living longer and staying alive that we have forgotten how to die. Too often we learn the hard way. As soon as the baby boomers pass pensionable age, their lesson will be harsher still...I live in hope - hope that before the disease in my brain finally wipes it clean, I can jump before I am pushed and drag my evil Nemesis to its doom, like Sherlock Holmes and Moriarty locked in combat as they go over the waterfall. In any case, such thinking bestows a wonderful feeling of power; the enemy might win but it won't triumph. I hate the term 'assisted suicide'. I have witnessed the aftermath of two suicides, and as a journalist I attended far too many coroners' inquests, where I was amazed and appalled at the many ways that desperate people find to end their lives. Suicide is fear, shame, despair and grief. It is madness. Those brave souls lately seeking death abroad [Ed: in places where doctor-assisted suicide is legal] seem to me, on the other hand, to be gifted with a furious sanity. They have seen their future, and they don't want to be part of it. I would like to think my refusal to go into care towards the end of my life might free up the resources for people such as him. What they are doing, in fact, is buying themselves a feeling of control. I have met retired nurses who have made their own provisions for the future with rather more knowledgeable deliberation. From personal experience, I believe the recent poll [Ed: which revealed that more than three-quarters of people in Britain approve of assisted suicide for the terminally ill] reflects the views of the people in this country. They don't dread death; it's what happens beforehand that worries them. Life is easy and cheap to make. But the things we add to it, such as pride, self-respect and human dignity, are worthy of preservation, too, and these can be lost in a fetish for life at any cost. I believe that if the burden gets too great, those who wish to should be allowed to be shown the door. In my case, in the fullness of time, I hope it will be the one to the garden under an English sky. Or, if wet, the library. Hopefully, with no small thanks to outspoken advocates like Jack Kevorkian, and the patients who have been brave enough to stand up for their right to die with dignity, Terry Pratchett will get his wish. 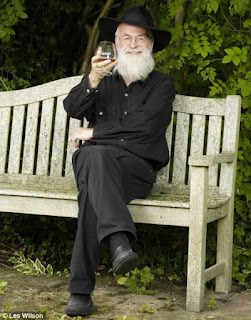 Terry Pratchett, in the garden, with his brandy.